I like the Pyrenees, particularly the foothills. Very green hills and valleys, with the mountains rising up into the clouds further back. 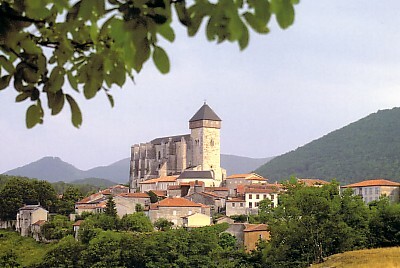 Yesterday we visited St Bertrand-de-Comminges, which is a village in the foothills. Today just a small sleepy village. I don't think I even saw any stores. But it is obviously a well-preserved fortified mideaval village on a hilltop. And on top of the hill you find a large cathedral, which obviously indicates that it has been an important place in the past. A great view from there as well. Eagles were hovering over the green valleys. The main parts of Cathedrale Sainte Marie were built in the 11th century by Bishop Bertrand, a cousin of Count Raymond IV of Toulouse, whom I happen to be reading a book about. The church is full of somewhat strange and humorous wood carvings. Lots of pagan influences, The Green Man, mermaids and monkeys, etc. And a magnificent 500 year old organ that is still playable. Having lived in the U.S. for so long, it seems particularly strange and awe inspiring that stuff that's that old can still be standing around. The town is much older, though. Previously, it was founded in 72 B.C. as the Roman town of Lugdunum Convenarum. It was ruled by Pompei, and grew to a city of 100,000 inhabitants. Lots of ruins have been found, like the amphitheatre and the forum. Seems like you can't dig anywhere without turning up old buildings. Even though the archaeologists can't get their hands on all of it. There's a new school right in the middle of the forum, and somebody's house in the middle of the arena. New stuff built on top of the old. Supposedly archaelogists rent fields from farmers one by one, for a year at a time, dig up what they can find, and turn it back into a field afterwards. 22 Jun 2004 @ 14:15 by Danny @63.164.145.198 : Long Time no Chat!!! Hey Flemming, it has been a while since I have either commented or e-mailed you. I am glad to hear that things seem to doing better. Marie enrolled and got accepted to cooking school, Zach is being Zach, and Nadia seems to be fitting right in. Birgit is the big ?, at this point, and as for you...seems like you are constantly blogging away. I hope that you guys can make it out here for Halloween, we will have to have a BBQ at either my place or my moms. I miss you guys, talk to you when I talk to you! Sounds like you're already up on the main things. Lots of details, of course. And, yes, I sure hope we make it there. We miss you guys too. A few of us visited St. Bertrand in September; our first time. We were amazed. Truly a hidden treasure. Thanks for the page. If you well, http://www.antalisthai.com/ is sunny. Wind and rain, he will http://www.antalisthai.com/products-959.html hold an umbrella in your heart; http://www.antalisthai.com/products-367.html The dark, he will point a light http://www.antalisthai.com/products-903.html in your heart; Sorry, he will be http://www.antalisthai.com/categories-17.html much comfort you; Crying, http://www.antalisthai.com/products-738.html he will give you a heart; http://www.antalisthai.com/products-577.html When tired, he would put his shoulder. http://www.iamtheinnercity.com/products-1305.html When he was in, you will http://www.iamtheinnercity.com/products-259.html feel warm, http://www.iamtheinnercity.com/products-663.html feel the deep love. http://www.antalisthai.com/categories-18.html In his absence, you will worry, http://www.iamtheinnercity.com/products-1287.html worry about him: "what's wrong with this man? http://www.antalisthai.com/categories-11.html Will not have a thing?" Cross the road, you will http://www.iamtheinnercity.com/products-240.html give him a charge, "pay attention to safety! http://www.antalisthai.com/categories-9.html The day is cold, you will be told him "dress!" He also http://www.iamtheinnercity.com/products-419.html often told you, the same passion. Will this apply to the Gmail app for Android and other mobile plamrofts as well? If so, when will the new Gmail app be released that will allow us to support this?As an admin for our email system after our migration from Exchange - thank you for this feature!